I love spicy food, and I'm an unapologetic carnivore. When cold season hits, I serve high octane protein on the basis that if it doesn't kill you, it will knock out any virus that came calling. Everyone knows how to make chili, you dump things in a pot and simmer until it tastes right. So don't take this recipe as doctrine, it's a starter template. Adjust as you like to suit your style. This dish is savory and sweet, with enough heat to handle your worst head cold, and kill small children. 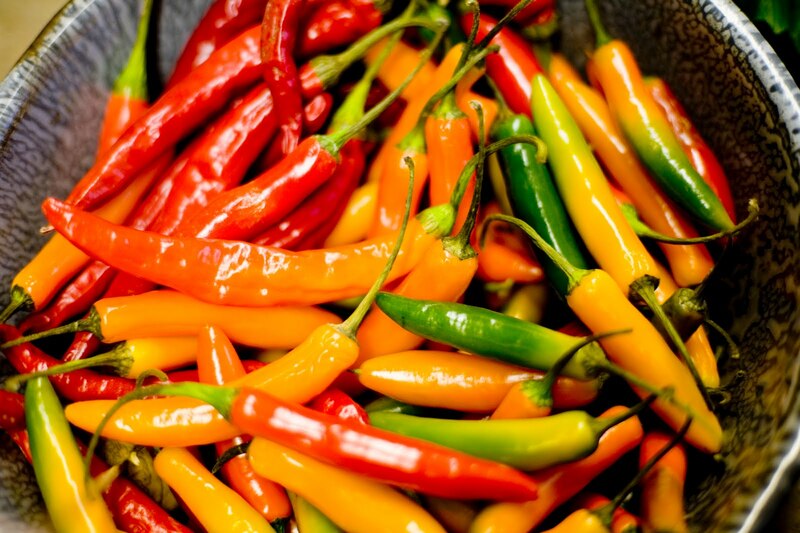 If you want something a little less spicy, use fewer - or sweeter- peppers. Or stir sour cream into your bowl when you serve. Dairy kills the heat factor. 1. Turn the oven on to 400(F), break the garlic cloves apart (leave the peel on), drop in the glass baking dish, drizzle with olive oil, cover with foil and bake until fragrant - about 20 minutes. 2. Broil the bell peppers and half of the chili peppers, brushed with olive oil for 2 minutes, or bake for 10, until skin starts to blacken. Using tongs drop the peppers into a plastic bag to sweat. After they are cool, peel the skins. 3. Add rinsed beans, tomatoes, corn, beef stock, and seasoning packet to the big pot. Turn on low to start heating to a simmer. I like making this in the crock pot because it can simmer all day. 4. Chop roasted pepper and garlic, add to pot. 5. Dice the bacon into 1 inch pieces, fry, add onions and turn the pan to medium-low. You want the onions to slowly caramelize and turn brown. This takes 20-30 minutes. If they aren't turning start adding sugar a pinch at a time. 6. Drain the grease from the bacon and onions. Add bacon and onions to the pot. 7. Bring pot to a rapid simmer. 8. Stir in cinnamon, cocoa powder, and molasses. Adjust seasonings as needed. 9. Simmer for 1-10 hours on low in a crock pot or 1-2 hours on the stove. Serve with your favorite toppings. In my house we top chili with sharp cheddar, avocado, sour cream, and cream onion and eat with tortilla chips or ladled over a hot dog on a bun.